This is the painstaking moment a truck toppled into a river as the owner tried to reverse off the banking. It reported to be the insane accidents ever at the river sides all over the world. 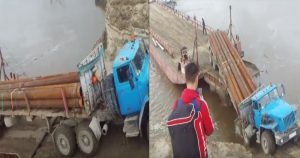 The footage begins by showing a man on the shore who is helping the truck driver in his directions to held the truck on the Barge(heavy loads carrier boat). But as he puts the truck into reverse, it drops into the river, driver-side down. The footage was captured in the somewhere from Russia, but the exact location is unknown. 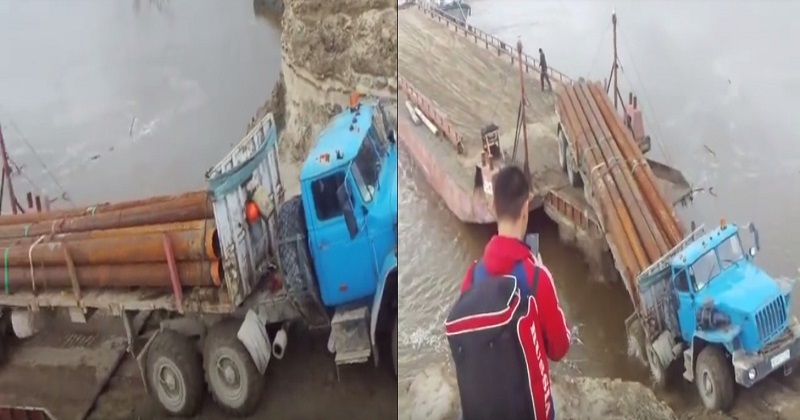 See what happens as he tries to reverse a loaded semi onto a barge. Think you’re having a bad day in the office? But thank the lord you’re not this guy. A truck driver, in what we’re guessing is somewhere in Russia, failed at the only thing he was expected to do – driving a truck!